Alan Cox’ recent announcement of his Unix-like operating system for old home computers got me thinking: wouldn’t it be cool write programs for the KC85/3 in C, a language it never officially supported? For youngsters and Westerners: the KC85 home computer line was built in the 80’s in Eastern Germany, the most popular version, the KC85/3 had a 1.75MHz Z80-compatible CPU, and 16kByte each of general RAM, video RAM and ROM (so 32kByte RAM and 16kByte ROM). The ROM was split in half, 8kByte BASIC, 8kByte OS. Display was 320x256 pixels, a block of 8x4 pixels could have 1-out-of-16 foreground and 1-out-of-8 background colors. No sprite support, no dedicated sound chip, and the video RAM layout was extra-funky and had very slow CPU access. 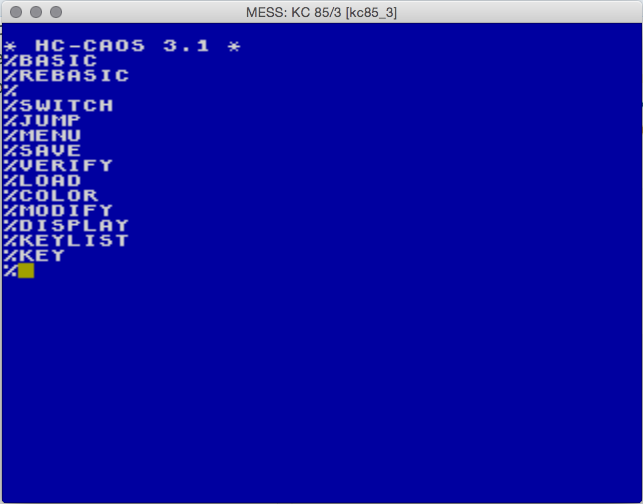 MAME/MESS has rudimentary support for the KC85 line (and many other computers built behind the Iron Curtain) and I dabbled with the KC85 emulation in JSMESS a while ago, as can be seen here: http://www.flohofwoe.net/history.html. So far this dabbling was all about running old games on old (emulated) machines. But what about running new code on old machines? And not just Z80 assembler code, but ‘modern’ C99 code? Good 8-bit C compilers are surprisingly easy to find, since the Z80 lived on well into the 2000s for embedded systems. I first started looking for a Z80 LLVM backend, but after some more googling I decided to go for SDCC, which looks like the ‘industry standard’ for 8-bit CPUs and is still actively developed. After I played a few minutes with the compiler I decided that starting right with C is a few steps too far. 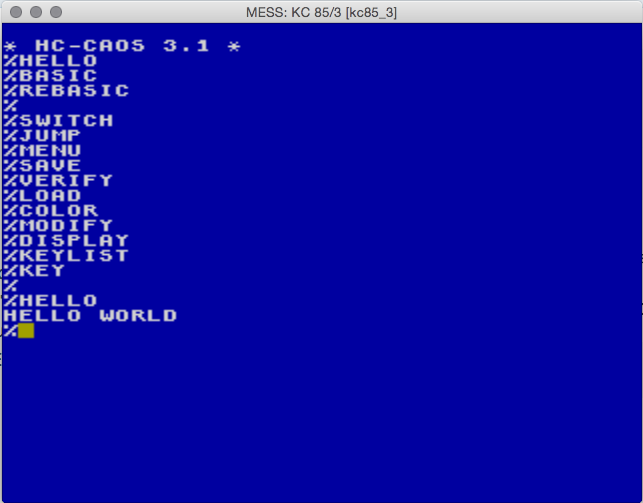 So if we had a piece of KC85/3 compatible machine code, and put it into a file with a 128-byte KCC header in front, we should be able to load this into the emulator. After the operating system function has executed, it will resume execution after the string’s 0-terminator byte. The final C9 byte is the Z80 RETurn statement, which will give control back to the operating system. This was the point where I started to write a bit of Python code which take a chunk of Z80 code, puts a KCC header in front and writes it to a .kcc file. And indeed the MESS loader accepted such a self-made ‘executable’ without problems. Before tackling the C programming challenge I decided to start smaller, with Z80 assembly code. The SDCC compiler comes (among others) with a Z80 assembler, but I found this hard to use (for instance, it generates intermediate ASCII Intel HEX files instead of raw binary files). With some more Python plumbing I was then able to ‘cross-assemble’ new programs for the KC85 in a modern development environment. Very cool! There’s 2 interesting files: hello.asm is a human-readable assembler source file, and hello.ihx is the final executable, but in Intel HEX format. The .ihx file can be converted into a raw binary blob using the makebin program also coming with SDCC. Thankfully SDCC allows to tweak all this and allows to compile (and link) pieces of C code into raw blobs of machine code without any ‘runtime overhead’, it doesn’t even need a main function to produce a valid executable. Very nice ! I wonder if there is a stdlib you can use from one of the other 8 bit computers. No, exactly it is not C99-programming. SDCC is not a full-functional compiler, and lacks even the complete support of C99, or even ANSI C. It is just a compiler aimed at small devices for simplify programming on single-chip micro-controllers. Some long-term issues were never been fixed, and I just crashed (SIGSEGV) the compiler after I wrote my second C program for my calculator. The right way to go is a complete port of standard Unix toolchains: GCC, Binutils and LLVM. LLVM support is more valuable because once it finished it will be possible to run any language that built on LLVM. Is there any chance you will continue writing blog posts? I really enjoy reading your technical explanations.